Tickle My Senses: Savoury Hot Egg Puffs using Mangalorean Spices! 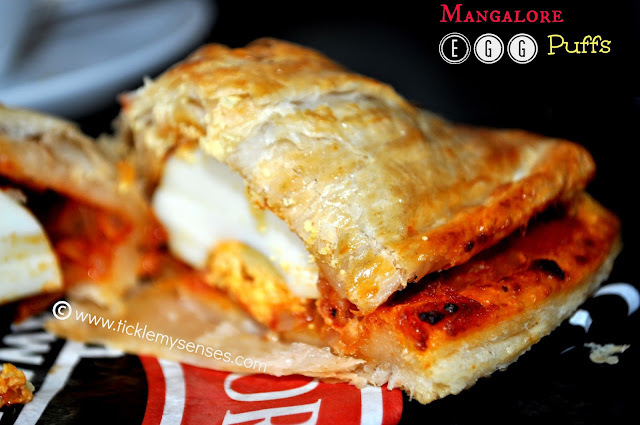 Light flaky layers of puff pastry enveloping a delightful spicy stuffing of Boiled Eggs with Mangalore spices, my definition of 'Tea time Ecstasy'. 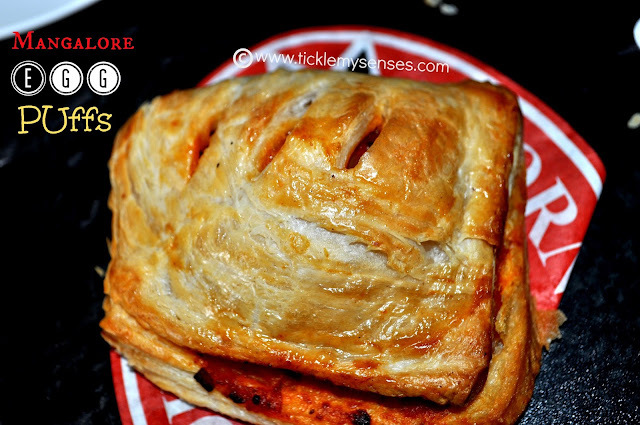 My fondest memories of these delish and enticing savoury Egg puffs goes back to the early 2000, when I was working in a dental college in Domlur, Bangalore, India. Our number one choice for unwinding from a busy morning would be at the local Kerala Bakery. Located at a busy junction, this small bakery was effectively filled up with coastal delicacies like the spicy chicken, mutton or egg puffs, local treats like aloo buns (spicy potato buns) dilkush, dilpasand (pastry filled with sweet tutti fruti or sweetened coconut), pastry horns (horn shaped pastry filled with sweet whipped cream), Japanese cakes, apple cakes, burfi's, pastries, badushah, tea rusks, freshly baked loaves of milk bread, fruit loaves all served with a piping hot cup of masala tea or coffee, chilled buttermilk (spice infused buttermilk) or a bottle of juice (frooti being my favourite or mango juice)....divine! The place was constantly buzzing with people with a rapacious appetite for these colourful and delectable treats. Back in the UK, with no Kerala Bakery in sight, I ventured out to replicate this wonderful treat using what was at hand. I made the basic onion tomato mixture then spiced it up using the Bunt Chilli powder ( the 'Mangalorean in me' wouldn't be at peace if I didnt :) you could use your favourite Spice Blend or Curry powder here). Must say the puffs turned out awesome. Truly delectable. I have since substituted the boiled eggs with simple fried prawns and served it as a party appetiser too. Gained many FANS ;) Try it out! 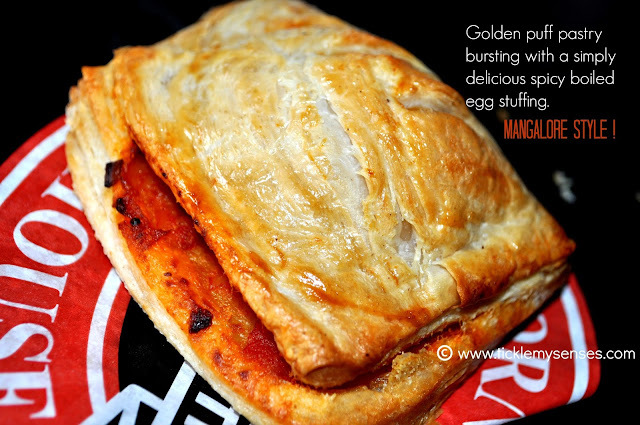 To Make Egg Puffs using Mangalorean Spices. 1. Boil eggs. Peel and keep aside. 2. In oil splutter mustard seeds, add curry leaves, fry. Add onions fry for 3-4 mins, add ginger garlic paste fry for another 2-3 mins till the raw smell goes. Next add chopped tomato and salt, fry till tomato softens. 3. To the remaining mixture add Mangalore Bunt chilli powder or any other curry powder. Adjust quantity of spice powder to suit your taste and fry for a few more seconds. Adjust salt and add lemon juice to taste. 4. Divide a ready rolled sheet of puff pastry to eight equal portions. Divide the cooled onion tomato spice mixture equally between them. Cut each boiled egg into 2 equal halves along its length. Invert one half of a boiled egg over the mixture, brush the sides of the pastry with water, close the pastry till edges meet and seal well. Place slits or a cross on top of the puff. 5. Place the puffs on a non stick baking tray well spaced from each other. Bake in a preheated oven at 200C or 400F for 12-14 mins or until puffed and golden. Enjoy with a hot cup of Coffee or Tea. If you enjoyed this post or do make these puffs I would love to hear from you. Leave me a line at the end of this post or on my Facebook page. first time on your blog, really awesome recipes! I tried your egg puff recipe yesterday and it turned out awesome. Thank you for it! !